4 votes for Democracy, 6 votes total needed to change. In our worst case scenario, the werewolf makes as many kills as possible, because he wants to influence the weight of the game very fast. So in our worst case scenario, the werewolf makes the next kill, to get his cooldown time out of the way, so he can start killing again. He is guaranteed to wack a non werewolf. Let's assume the worst, and say he knocks off a townie. So now we have 1 werewolfs, 5 townies, and one jester. Jester probably does not want to accidently kill the last wolf, so hes probably lying low or trying to provoke an attack. So whats the best move for the townie? From how this game has been moving we should be able to get in a load of kills as long as we attack rapidly. Meaning if a wolf strikes even once, the town can answer with an onslaught of blood and carnage while he watches helplessly in a cooldown phase. Day phases start immediately, and only take a couple hours of recharge, so I bet that if we strike quickly each day phase, we could sneak in at least 5 kills during a wolves cooldown phase. -If the townie kills somebody at random, they have a 1/6 of killing wolf. Doing the math here, the chances of a wolf surviving a rampage of townies out for blood from this point in time = 5/6 * 4/5 * 3/4 * 2/3 * 1/ 2 = .167. In other words, by randomely killing eachother as fast as we can, the town has 83.3% chance of winning this game. Man this games going fast. I'm here too. Cirt and Necropolis receive MOD penalties for posting after allowable time. Knuckle is Dead and can no longer post at all. Knuckle was a Townie. 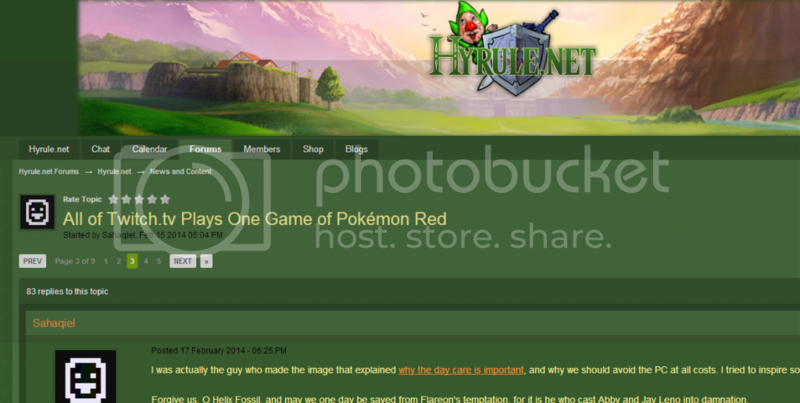 Knuckle was all of the viewers from Hyrule.net. No longer will they enjoy the various memes of TPP, nor make profit on related goods and services. Phase 5 begins at precisely 17:00 Eastern Standard Time (140 minutes from the time of this post) without any further indication from me. The game will be in Anarchy Mode. Players may now post. It's the fifth day of the social phenomenon, TwitchPlaysPokemon. 120,000 people have tuned in, at 3 a.m., to watch the character defeat the trash maze in Lt. Surge's gym. You didn't even go to bed last night. You haven't showered, or eaten. A wave of thrill washes over you with every input command you enter. Every time the Helix Fossil is "consulted", you praise it along with the rest. You're not sure anymore that you're joking. I'll still hold off on attacking for right now. Do I have to reaffirm my democracy vote?